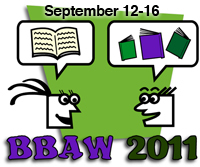 Home » About Book Blogging » BBAW Day 2 – Blogger Interview! BBAW Day 2 – Blogger Interview! Day 2 of Book Blogger Appreciation Week 2011 – This year’s theme is Cultivating a Community of Bloggers and Readers. Today’s topic is blogger interview swap. My interview partner is Linda from Silly Little Mischief ( http://sillylittlemischief.blogspot.com/). When I looked at her blog, I was amazed at her history – quite a lot to see and read! – and at the list of books that she reviewed and read. I asked to be her friend on Goodreads and found that we have quite a few books in common. What a fun way to meet a new friend! The questions I asked Linda had a lot to do with her blog and blogging and less to do with her books and reading, but hopefully you learn something fun here! Wow – you’ve been blogging a LONG time (since 2007!)! Can you talk about your blogging beginnings? I started blogging because I needed a place to dump all my thoughts on my 2008 wedding. Since then I’ve added posts about my life (books, food and travel). Your blog is really organized and interesting to look at. Can you talk about the technical aspects of your blog – have you always used your format or have you tweaked a lot throughout the years? Do you get help from someone? Do you have any sponsors? Thanks. I’ve switched templates several times over the years. I know a little HTML but I rely on premade templates for most of my blog. If I see something I like on someone else’s blog I’ll email them to find out how I can get it. I don’t take sponsors or paid advertising. Do you follow a blogging schedule? Where do you look for topic inspiration? I usually blog Monday through Friday. I try to post every day. I look for inspiration everywhere-other blogs, my life. How about your blog reading – do you catch up daily? Twice daily? Weekly? with the blogs that your read? We have read a lot of the same books – I’m definitely going to look for you on goodreads. Do you have a favorite genre or style of writing? I generally read fiction (sci-fi, chick lit, YA, classics) but I will read nonfiction too. What book do you love that other people seem to dislike? I get a lot of grief from my real life friends about the amount of YA I read. A lot of them think I should be reading more adult books. What book did you dislike that others love? I’ve been trying to read some classics-Catch-22, The Sun Also Rises. I haven’t really enjoyed too many of them. I did read Jane Eyre and enjoyed it. What do you find to be the most rewarding thing about book blogging, or blogging in general? I love the dialogue that comes with blogging. Not just the comments but the posts that come out of what someone else said. I don’t blog in a bubble and I love interacting with other bloggers and my readers. Thanks Linda! Great to meet you! This entry was posted in About Book Blogging and tagged BBAW, Blog, Blogger interview, Google Reader. Bookmark the permalink. Making new friends is my favorite thing about BBAW! What a wonderful interview. Its great to get to know a little bit more about Linda. I had no idea you had been blogging since 2007. WOW..keep it up. 422 blogs? Crazy! I can’t keep up with a few over a hundred. Boo to friends who give you a hard time about reading too much YA. They obviously don’t know how *great* a lot of it is! I can’t IMAGINE 422 blogs! I am under 100 but creeping up there during BBAW!